Preheat the oven to 350 degrees. Line a 9 by 13-inch pan with parchment paper and cooking spray. In a medium bowl, whisk together the flour, baking powder, cinnamon, nutmeg, cream of tartar and salt, and set the mixture aside. In a second bowl, cream together butter, brown sugar and white sugar, and then add the eggs and the vanilla. Stir in the flour mixture and blend well. Spread the batter into the prepared pan, evening it with a spatula if necessary. Bake 25 to 30 minutes or until a toothpick comes out clean or with a few crumbs attached. Let the pan cool completely. Makes about 30 small bars. Adjust oven rack to lowest position and heat oven to 325 degrees. Spray an 8-inch square metal baking pan with vegetable-oil cooking spray. Fold a 16-inch length of heavy-duty foil to 7 1/2 inches wide and lay it across pan bottom and up two sides so you have foil overhangs to pull blondies from pan. Spray foil with vegetable-oil spray. Whisk flour, baking powder, cinnamon, and salt in a medium bowl. Whisk brown sugar into butter in a medium bowl. Whisk eggs and vanilla together in a small bowl, then whisk into butter mixture. Whisk in dry ingredients until just combined. Fold in cinnamon chips or stir-in of your choice. Pour batter into prepared pan. Bake until blondies are just set, about 40 minutes. Remove from oven and let cool for 5 minutes. Using foil handles, pull blondies from pan, set on wire rack, and cool to room temperature. Cut into squares and serve. Preheat oven to 350 degrees. Grease a 9×9 inch baking pan and set aside. Beat together the butter and brown sugar, then add eggs one at a time. Add vanilla. In a separate bowl combine flour, baking powder, salt, cinnamon and nutmeg. Slowly add to liquid ingredients and mix until combined. Dough will be thick. Spread into greased pan and smooth top as much as possible (either with back of spoon or spatula). Combine cinnamon and sugar, then sprinkle on top of dough. Bake for approximately 30 minutes. Mmm! I love blondies. 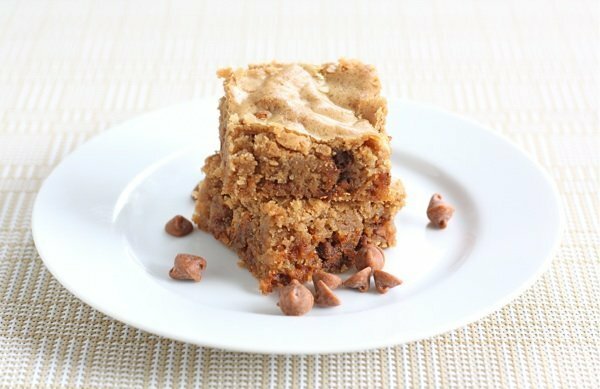 I'm not a HUUUGE fan of chocolate... (although sometimes I get chocolate cravings) but I loooove blondies! I've had a pretty good weekend so far, last night I went over to my friend Sam's house for girls night, and we decided to get together every Tuesday night at her place for girls/craft night! She has an AWESOME upstairs loft with slanted ceilings and exposed brick... my favourite! I'll have to take photos on Tuesday. It's kind of my dream room, haha! So I'm excited about that! That's going to be a ton of fun. And we can make things for De's wedding! I'm so excited. Today Keith & I went out with my friend Erin for coffee and we met her boyfriend Will. We had a really good time with them & hopefully will see them again soon! Will is working in the States right now but he comes up to Canada as often as he can. Then after that I went to my Baba's house for her birthday (for cupcakes) & then I came home and have been looking at things to do in France! Oh yeah, did I mention I'm going to EUROPE?! I'm so excited! I'm going at the end of May & beginning of June. We're going to France, Italy, Germany & Switzerland. Ahhhhhhhhhhh. I've never been, but I'm SO so soooo pumped! Have any of you guys been before? Let me know what some must do things are! I can't wait!! hahah, Blondies. that is like what a japanese person would say when trying to say brownie (i'm japanese...so it's ok that i say this, haha.) fun recipes! yummmmy! i'm like drooling looking at these! i can't wait to make some of the snickerdoodle ones! I love blondies - totally yummy! mmm i am a HUGE fan of blondies!! maybe i'll just have to make some soon!! How fun that you're going to Europe! I spent 7 years in France, 3 in Germany, and have been to some fun places in Italy and Switzerland - you're going to have a blast!! My goodness these all look so scrumptious! Yum, bookmarking for the recipes!